These Picture Frames Are Part Of Our Huge Swing Frame Product Line! These Picture Frames Have A Wood Front With Cherry Finish! 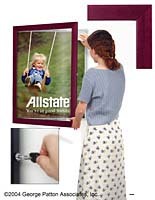 Picture Frame with Swing Front - Mounting instructions and hardware are included with this swing front picture frame. 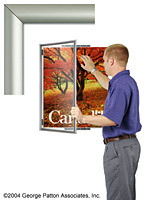 This Picture Frame comes fully assembled and is very easy to mount on your wall. It is made for interior use only. Your clients and staff will really notice your advertisements when they are framed in this stylish swinging picture frame. You will love the simple gravity latch system, which allows you to replace pictures quickly and easily in less than a minute because of the included removable/reusable mounting tabs. 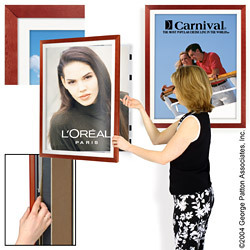 This Cherry colored wood framing gives your picture framean upscale look. 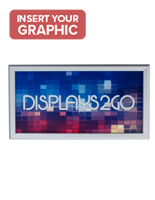 This Hanging Picture Frame is designed for graphics with dimensions of 22"w x 28"h. The outside frame dimensions of this frame are 26 ¾"w x 32 ¾"h x 1 5/8"d. This frame includes a white mat board which helps to set the poster apart from the frame. The mat board will cover ¼" of your poster on each side. This makes a viewing area of 21 ½"w x 27 ½"h. The simple and effective gravity latch system is hidden out of view but keeps the frame securely closed. 26.8" x 32.8" x 1.6"